Gorgeous Connie, love these two colours together. Beautiful image, I do love hummingbirds. Such a beautiful card! I love the image and fabulous layers. Thank you for sharing with us at the Ribbon Girl, good luck and I hope you will join us again. You're rocking on those clean and simple cards lately! Love the color combination and the little hummingbird is so pretty. That's great that your granddaughter has raised a third of the money she needs. She'll make it in time and then do great when she's there. Gorgeous colouring, must get mine done! Love the blue and green and the pretty gingham bow. Beautiful card - I love the vibrant "pop" of the blue ribbon against the green, counterbalancing the delicate colouring. Thank you for sharing it with us at Crafty Cardmakers. Such a gorgeous card sweetie. Thanks for joining in with The Ribbon Girl April card challenge and good luck in the prize draw. Connie, I love the hummingbird and flowers. 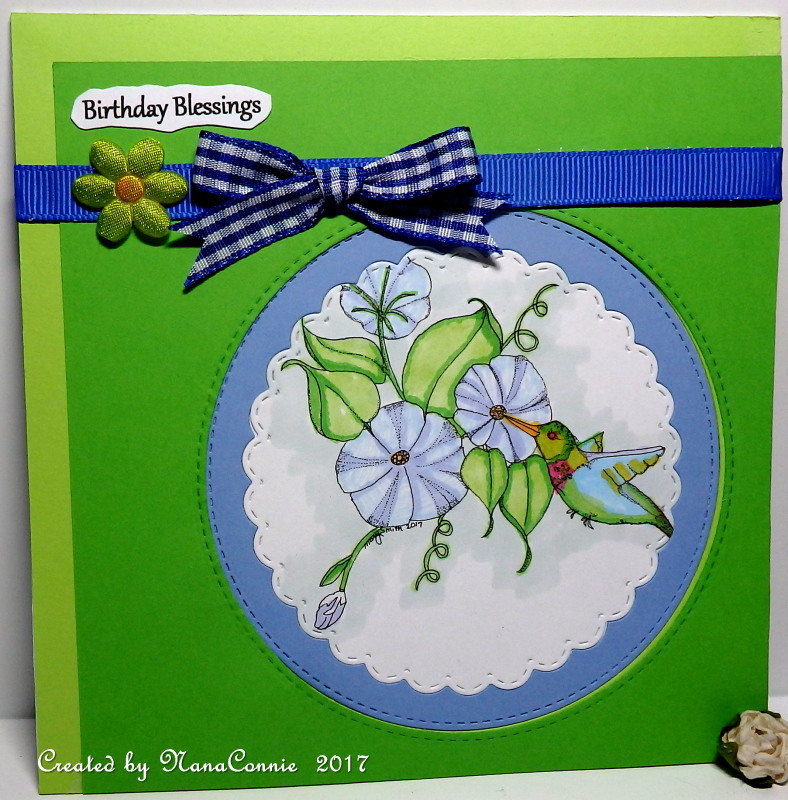 Thank you for joining our Spring into Spring Challenge at Crafty Cardmakers. Love your card and love the sketch. I must get busy and do mine. You are always on top of things, envy you :O)!